The beam sent out by the antenna illuminates an area on the targeted object. The “footprint” of an SLAR or SAR antenna is the size of this area illuminated by the SLAR or SAR transmitter. The size of this area, i.e. the size of the footprint depends on the real size of the antenna. The recorded echo-signal strength depends on the energy backscattered from the target inside this footprint. Furthermore, this footprint depends significantly also on the flight altitude or the height of the orbit. 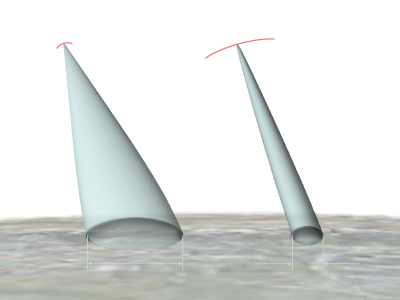 Example given: For an radar-altimeter in a 1000-km orbit a half-power beam width of 0.32 degrees would lead to a footprint of diameter 2.8 km.